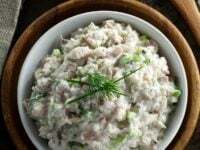 Whitefish Salad – The history of smoked fish, “appetizing”, and a recipe for Jewish whitefish salad with celery and herbs. The term “whitefish” refers to several species of freshwater fish that are commonly used in Ashkenazi Jewish cooking. These inexpensive and versatile fish are used for a number of purposes– they can be poached for Shabbat, ground into gefilte fish, and smoked. Whitefish is sold as either a whole fish or a fillet cut. It can be found in most Jewish delis, kosher markets, and “appetizing” stores like New York’s famous Russ and Daughters. Smoke-curing is one of the most ancient methods of food preservation. When smoke-curing fish, the fish is dried and salted to remove all moisture (moisture creates a breeding ground for bacteria). It is then exposed to smoke, another element that slows down bacterial growth. The smoke combined with the salt creates a unique flavor that has become synonymous with Ashkenazi Jewish cuisine. The process of smoking whitefish was adopted by Eastern European Ashkenazi Jews; smoked fish was stored and eaten throughout the long, harsh winter season. Smoked whitefish was later brought to the U.S. during a mass Jewish immigration that began in the late 1800’s. American Jews found an abundant source of whitefish in the Great Lakes of the northeast. Much of the smoked whitefish sold today comes from the Great Lakes. Modern smoked fish is less salty and pungent than smoke-cured fish; we now have refrigerators, so fish is smoked and salted for flavor more than preservation purposes. That makes for a more delicate, moist, and softer fish with a truly delightful flavor. 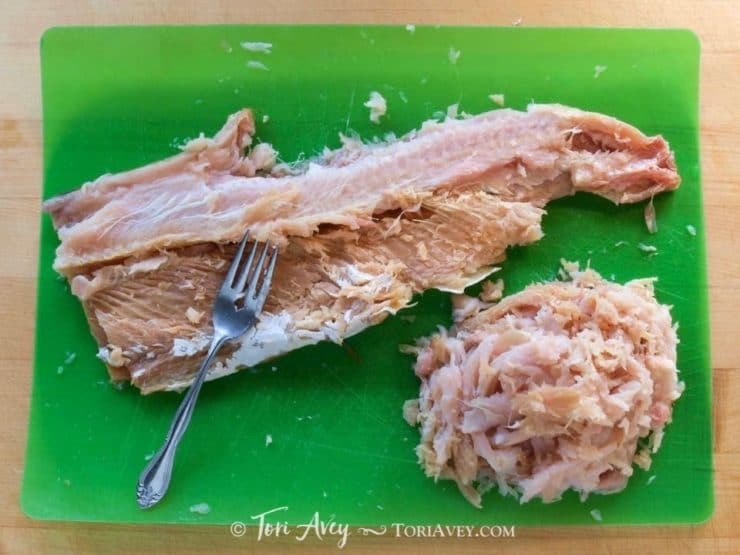 Removing the meat from a whitefish is a little more work than opening a can of tuna fish, but the flavor is so much more complex. It takes me about 10 minutes to get the meat off the fish, deboned, and into the mixing bowl. If it’s already filleted, that makes things even easier. I don’t add a lot of extra ingredients to the salad, except for a few fresh herbs and some lemon juice; the smoking imparts a lot of flavor and doesn’t need much “dressing up.” I usually use a mixture of mayonnaise and sour cream in the salad, but you can substitute all mayo to make the dish pareve. You can also add a little minced onion in there for spice, if you wish. Make sure you taste and season accordingly; don’t add salt until you taste, since the smoked fish has a lot of salt in it already. By the way… the cheapest place I’ve found whole whitefish is at my local kosher market, where a 2 pound fish sells for around $16. A few months ago, they tried to sell me the same sized fish at a local deli for $54. I told them thanks, but no thanks! Smoked whitefish shouldn’t be pricey, it’s not an expensive fish to begin with. So don’t let anybody charge you more than $10 per pound, unless you’re in an area where there aren’t too many kosher markets or delis. If you are, you might have to pay a premium to an appetizing store or gourmet market to have it shipped. I’ve posted some serving suggestions below this recipe. The salad can be made gluten free using certified GF mayo and sour cream. 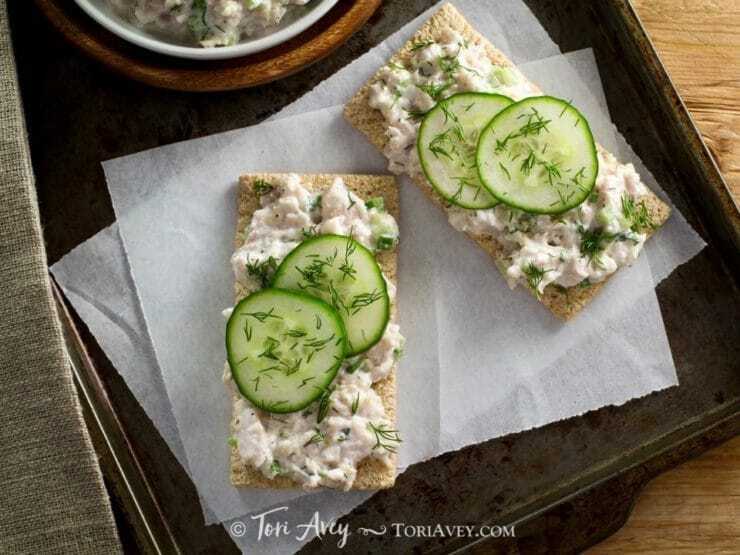 Whitefish salad makes a great appetizer spread– serve it atop rye crackers or pumpernickel bread for a dainty treat. Or, make a meal out of it and create a bagel sandwich layered with cream cheese, lox, thinly sliced onion and whitefish on top. Goes great with a hot bowl of deli-style soup like split pea or my Mushroom Barley Soup. The perfect winter meal. Bete’avon! 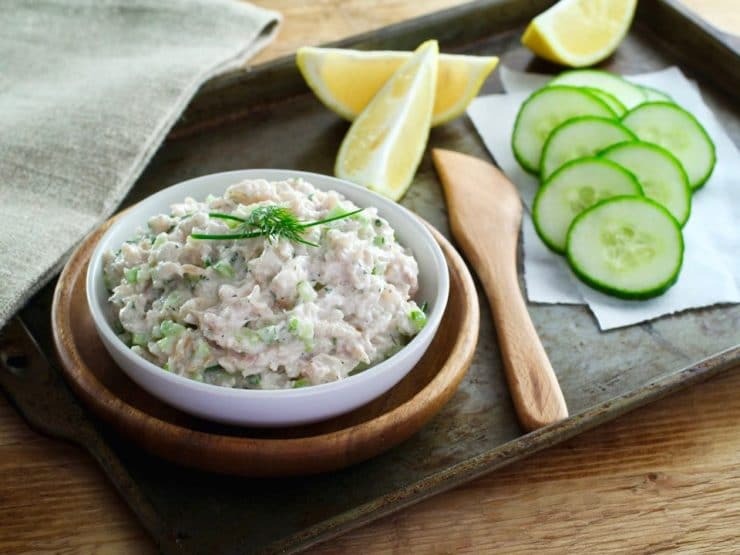 A delicious traditional recipe for Jewish whitefish salad with celery and herbs. Purchase a whole smoked whitefish of about 2 lbs. Smoked whitefish can be found at kosher markets or your local deli. If you purchased fillets, remove the skin, then skip ahead in the directions to where it says "When the fish is cleaned..."
Peel the skin from the whitefish. It should come off easily, like paper. On each side of the fish, you will see a center line running from tail to gill. Using a fork, pull the meat outward from that center line, following the diagonal grain of the meat. Pulling the meat from the bones in this way will help you avoid the tiny bones that are sometimes caught in the meat. Place the meat in a pile beside the fish. When the fish is cleaned, flake the meat in small pieces into a mixing bowl, checking for bones with your fingers as you go. If you notice any bones, remove them and discard. Once the meat is in the bowl, shred it with a fork and your fingers. Remove any additional bones you might have missed. 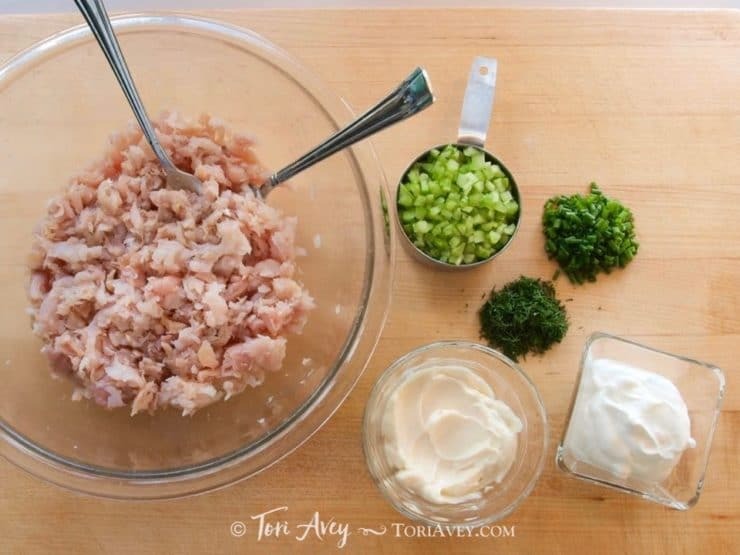 Add mayonnaise, sour cream, celery pieces, dill, and chives to the whitefish and use the fork to blend. Season the salad with pepper and fresh lemon juice to taste. I usually don't add any additional salt, since the meat is quite salty, but you can add some if you feel the salad needs it. Also, I like a lot of lemon juice in this salad-- I usually squeeze the juice of 1 whole lemon in, at least. Stuffed Tomato: Core a fresh tomato and scoop out the seeds/pulp. 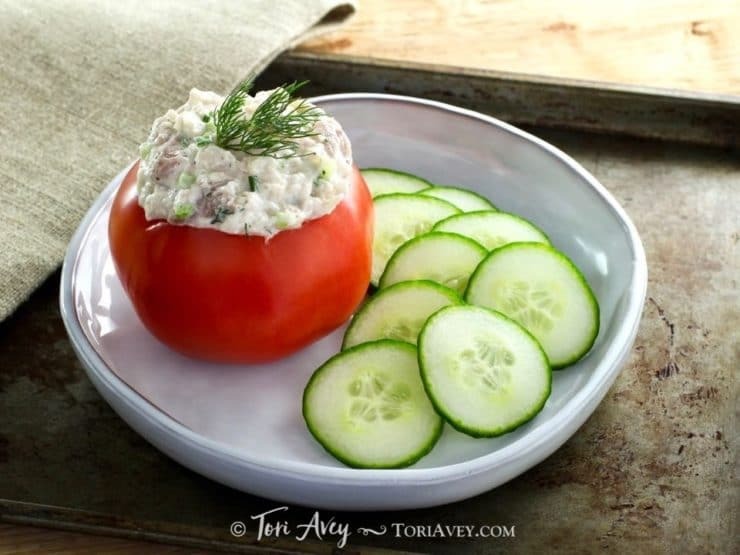 Fill the tomato with whitefish salad. Garnish with fresh dill and serve with sliced Persian cucumbers. This serving suggestion is low carb and gluten free. You can also stuff half an avocado instead of a tomato, if you prefer. 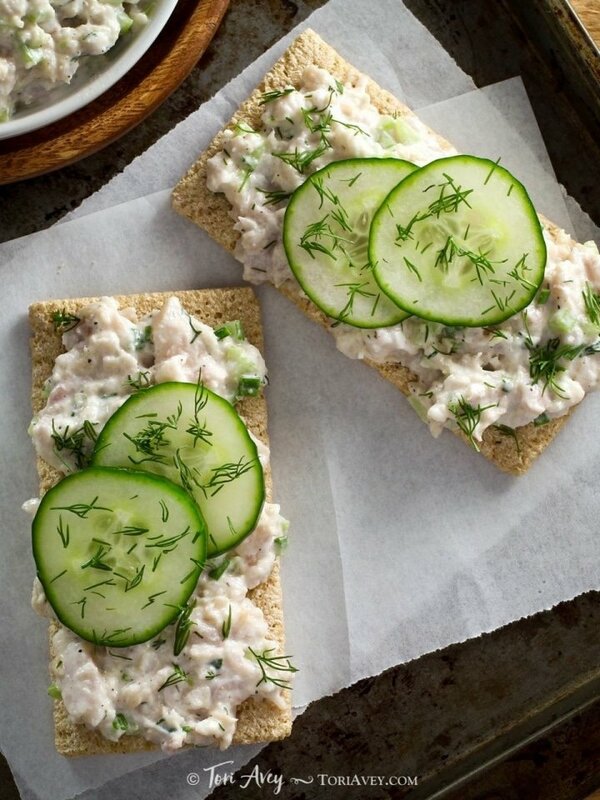 Whitefish Appetizer: Spread whitefish salad onto a cracker made from rye or your favorite whole grain. Garnish with two half-sour pickle slices and fresh dill. 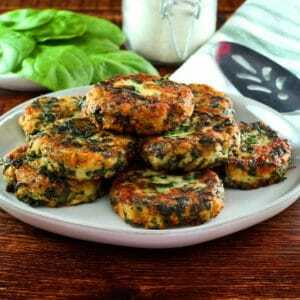 This makes a great appetizer, or serve with a bowl of soup or salad for a light lunch. Whitefish Bagel Supreme: Toast your favorite flavored bagel. Spread half of the bagel liberally with cream cheese. Add a few slices of lox and some thinly sliced onions. Top with a scoop of whitefish salad. Serve open-faced topped garnished with fresh chives. Or, to make a more filling meal, close the sandwich with the other bagel portion and slice the sandwich in half. Great recipe. But I am so sure about 1-2 lemons. I put half a lemon in and it is already too acidic for my taste. Should the salad have a sour taste to it, or is lemon juice supposed to be added just balance? Thanks Jason. Lemon should be added to taste. We like ours pretty lemony, but if you prefer a less acidic taste feel free to cut down. The nutritional guide gives calories etc. per serving, but there is no serving size. Please help! Hi Marcia, the nutrition feature was recently added to my site. 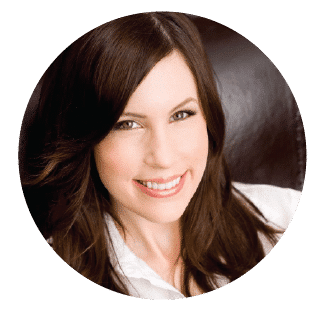 I developed many of the recipes on my site without knowing that the nutrition feature would eventually be added. That means I didn’t always measure the final quantity that a recipe makes; the number of servings are a guesstimate. You would need to measure the full quantity of the recipe, and then divide it by serving numbers to get a serving size. I am trying to measure add more specific information when I go back and make older recipes again, but it will take time as I have hundreds of recipes on the site. Thank you for your patience! I make this salad all the time using poached cod. I add 2 drops of liquid smoke to the dressing. I then refrigerate the salad for 2 hours before serving. It’s milder then using smoked white fish, but it is absolutely delicious and less expensive to make. Hi Tori, I’ve been using your website for years in London, but I just moved to Singapore so now I don’t have access to smoked (kosher) fish. Do you recommend a smoking process/recipe? Hi Aliza, that is not something I have covered yet, but I will keep it in mind for a future post! I live in Newport Rhode Island. 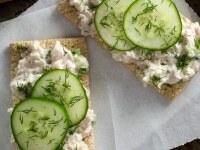 Where can I buy smoked whitefish and/or whitefish salad? I found this recipe a couple of years ago and thought you should know it has never failed me. I’ve made it so many times, scaling it up or down depending on the amount of whitefish has been no problem. Thank you so much for sharing it, my husband and I both love it! Hi Tori! Just made the whitefish salad. It is fabulous — but I made a couple of slight modifications. My mother-in-law has made this for the holidays for the last 2 decades. As she is advancing in age, the “chore” of making this has fallen on me. I tried to modify the recipe to be closer to hers. I upped the amount of dill to 3 Tbs. Instead of chives, I used scallions and upped the amount to 3 Tbs. To make it a little creamier, I used a half cup of mayo and a half cup of sour cream. What would you think of adding capers? I live in Toledo where unfortunately there are no Jewish Delis I know of anymore. I have been craving smoked whitefish like we used to have on Sundays growing up. What is the best smoked whitefish to buy? I use Acme smoked whitefish and have never been disappointed. Ver Brugge Foods in Oakland probably sells smoked whitefish and Saul’s in Berekely should have whitefish salad. I am not positive. Left the East Bay in 2001. Good luck! Just bought a beautiful smoked whitefish at Costco! Whole Foods has smoked whitefish but not all locations. You can call first. I just purchased some yesterday. Their homemade high quality smoked salmon and Gravlox are some of the most delicious I’ve tasted – and more affordable than a deli. Saul’s in Berkeley has the best whitefish salad. But pricey. That’s why I looked up the recipe. I found whitefish at Whole Foods in San Rafael. I looked in 6 Whole Foods and that is the only one in my area that carries it. For the woman who needs it cooked, this type of fish is delicious poached. Just put the fish in a pan with a small amount of water and a tight lid. Simmer for 2-3 minutes. That would also make it easier to get the bones out. You can usually get it at Whole Foods – I think it goes for about ten bucks a pound, which is very fair considering how much they charge for fresh fish…. Thanks for such great content. Thanks Barbara 🙂 Happy cooking! I would like to know if i could order your white fish and have it shiped? Hi Cherry, great question. As far as I know, it depends on the smoking process. Whitefish is often hot smoked, which does cook the fish. Cold smoking does not, so you would definitely want to avoid any fish that has been cold smoked (smoked salmon is often cold smoked, and sometimes whitefish). Because you’re dealing with a health concern, I think it would be best to check with a fishmonger or somebody in your meat/deli department to make sure the fish has been hot smoked AND fully cooked to be extra safe. Also you should probably double check with your doctor. I wouldn’t want to steer you wrong, and I am not a smoking expert or a health expert… just a fan of smoked fish. 🙂 So glad to hear the bone marrow transplant went well and you are on the road to recovery. Hope you can find some whitefish that works for you! I have no idea where to buy whitefish. I don’t think we have kosher markets anymore in Toledo. We used to. You can find smoked whitefish at Meijer’s in Sylvania. They are cut up into large chunks, about 1/2 lb. in each package. You can dine them on the counter directly below the window with the fresh fish. So I gad whitefish salad almost 10 years ago at a friend s family members funeral. It was delicious and recently I’ve wanted it aftrr 10 years. Followed recipe above and added boiled eggs. Taste delicious!! Glad you liked it Andrea! I just bought my first whitefish at CostCo and found this site while looking up recipes. We’re trying to stop eating so much tuna because of the mercury. CostCo has a smoked salmon that we love from The Honey Smoked Fish Company and, this week I noticed the whitefish stacked beside it and decided to have an adventure. I’ve never had whitefish – only read about it in novels. So, I made a salad tonight and it was just fine! We ate it on some homemade crackers with yellow tomatoes and sliced red peppers. Thanks! Have not gotten any this year as we have finally gotten a freshmarket and they carry it year round,plus at this time of year Costco also carries it. Happy childhood days in Chicago. We add capers though. It was Friday supper since as a Catholic couldn’t eat meat on Friday. 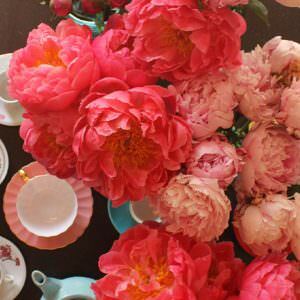 It is wonderful with boiled potatoes and sour cream. I live on Long Island, born New Yorker. Just finished making whitefish salad. Not difficult. Save your lox for another bagel, another time. Beautiful! Want to make this ahead for Passover — how long do you think it’ll last in the fridge? Thanks! 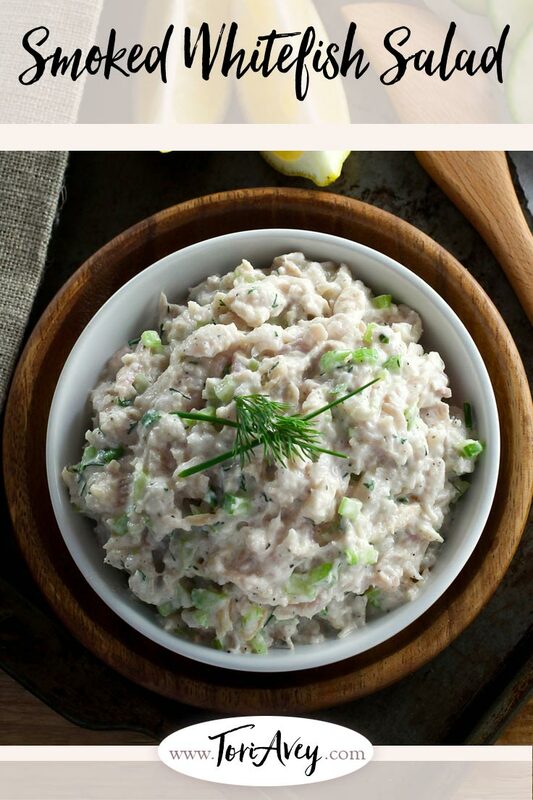 Whitefish salad is one of my FAVORITES, but I’ve never attempted to make it myself (I just pick it up at the deli). Thank you for showing how I can easily do it myself. I loved eating smoked whitefish directly from the fish, so to speak, as a kid. Since there are no delis to speak of around here in my area of Colorado, it’s been a while since I had any. Instead, I smoke the trout my husband catches – really delicious. Check, double check & triple check for bones! A few years back when I made whitefish salad a bone got stuck in my husband’s throat! He didn’t realize at first and was clearing his throat all day. Finally he went to an ENT doctor & he looked down his throat & pulled out the bone with a tweezer. He asked if he had eaten whitefish!!!!! I have a jar of Mother’s All Whitefish in juice. We tasted one piece and didn’t like it. I was wondering if I could turn these little fish “patties” into something else like that Whitefish Salad that you made out of smoked white fish. Can I do that with the stuff in the jar? Hi Pat! I’ve never tried whitefish in a jar, so I’m not sure. Wish I could help! I always re-cook the jarred gefilte fish. I place sliced carrots, celery and onion in the bottom of a large dutch oven. Cover with the jarred fish (usually 6 pieces to the jar). Pour in the “juice” from the jar. Then fill the jar 1/3 full with hot water, add 1/2 Cup sugar to the water to dissolve it. Pour over fish and simmer all till carrots are tender – 20 to 30 minutes. Chill and serve with horseradish. This is one of my favorite things in the world. Luckily, I grew up in Brooklyn, where it was widely available. I now live in NJ, and work in NY so can get my fix whenever I like. However, I never once considered making it from scratch, so thanks so much for posting the recipe! 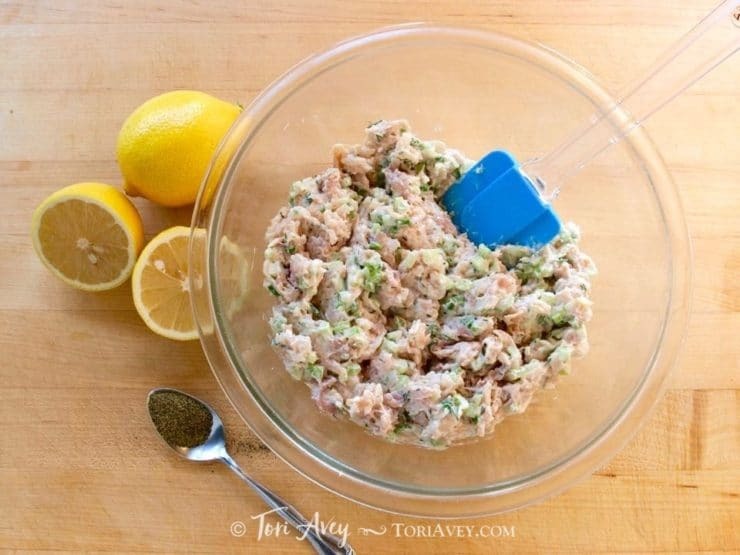 This would be a nice treat to make for the members of my family that appreciate fish dishes. 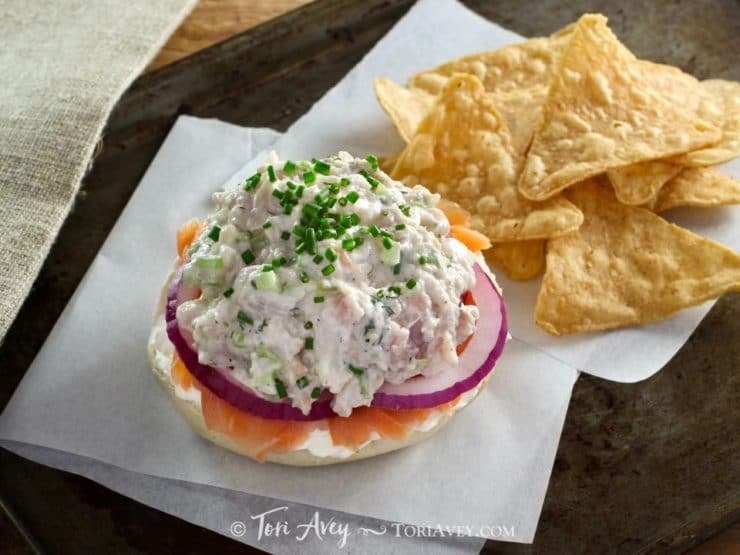 Whitefish salad is my absolute favorite kind of “appetizing.” The bagel place near my mother’s house on Long Island makes excellent whitefish salad – whenever I visit that’s my first stop. It’s hard to find good whitefish salad in Los Angeles. Costco has one brand that’s not bad…but it’s not like New York. My sister in Arizona gets hers at Costco. I live in Redondo Beach and I think they have it in Bristol Farms. Also, I think Whole Foods might have it. Of course if you go to the Fairfax area (Canters) there are probably little places that carry it. My Mother would be sooooo proud of you! Delicious. Much easier to make that it seems when reading. A doubly nice surprise :-)!!! So Glad I found your site… YUM!! I love white fish – my favorite is having this with a breakfast with crackers and salad. Great recipes. Karen G. I am sooooo confused. Are you in Chicago or Phoenix? Because each place, darling, should be swimming in delis and supermarkets (kosher and non). I will be so happy to assist you at least with the Chicago area in your quest. You sound like my brother who lives in NY state in a very small near the mountains. Not even a bagel to be had. When he visits “Home” he has to take back care packages on dry ice from his favorite spots. It can be done……..
Also, I have a great recipe for smoked whitefish gefilte fish. The recipe came from Epicurious and it is delicious! Just thought I would share! Cook carrots in pan of boiling salted water until very tender, about 8 minutes. Drain, reserving 1/2 cup cooking water in small bowl. Stir matzo meal into water; let stand 10 minutes. Place carrots in processor. Heat olive oil in heavy medium skillet over medium-low heat. Add onion and sauté until soft, about 5 minutes. Add green onions and stir 1 minute. Add onion mixture to carrots in processor. Add matzo meal mixture; blend until mixture is pureed and smooth. Using electric mixer, beat 3 eggs and lemon juice in large bowl until foamy and slightly thickened, about 4 minutes. Stir in mixture from processor; do not clean processor bowl. Blend fish fillets, smoked fish, salt, and pepper in same processor bowl until fish is finely chopped. Add remaining egg and blend to coarse paste. Add fish mixture to matzo meal mixture and mix thoroughly. Cover and refrigerate until very cold, about 2 hours. Line large baking sheet with waxed paper. Using wet hands, shape 1/4 cup fish mixture for each dumpling into egg-shaped oval. Place on prepared sheet. Cover with waxed paper and chill while preparing cabbage and steamer. Push garlic through garlic press into small bowl or mince garlic and place in small bowl. Mix in horseradish and lemon juice. Gradually whisk in mayonnaise. Season sauce with salt and pepper. Cover; chill up to 1 day. Line plates with lettuce leaves. Arrange 1 or 2 fish dumplings on each. Spoon lemon-horseradish sauce alongside. They didn’t when I recently lived there – surprisingly, good deli was hard to find. Fox and Obel downtown had a great selection, but for amazing smoked fish you have to drive out to http://www.hagensfishmarket.com/ , though I see getting the link that they also participate in a delivery service now! Amazing fish. Try the sable. Karen and Lolly, you can order smoked whitefish from Russ and Daughters. Not cheap, but I hear it’s delicious, and they will deliver overnight to a U.S. address. Might be worth a shot if you’re really craving it! Thank you for the childhood memories. Okay, NOW I’m starving! Hmmmm, and no whitefish to be had in my little desert town, guess my memories will have to get me through. My problem as well! I used a tin of kippered herring with some baked cod. I threw in a handful of frozen peas. Oh how I miss smoked whitefish. In my neighborhood in Chicago I used to be able to buy it at the supermarket. Now the closest place to get it is Phoenix and that’s 300 miles away. 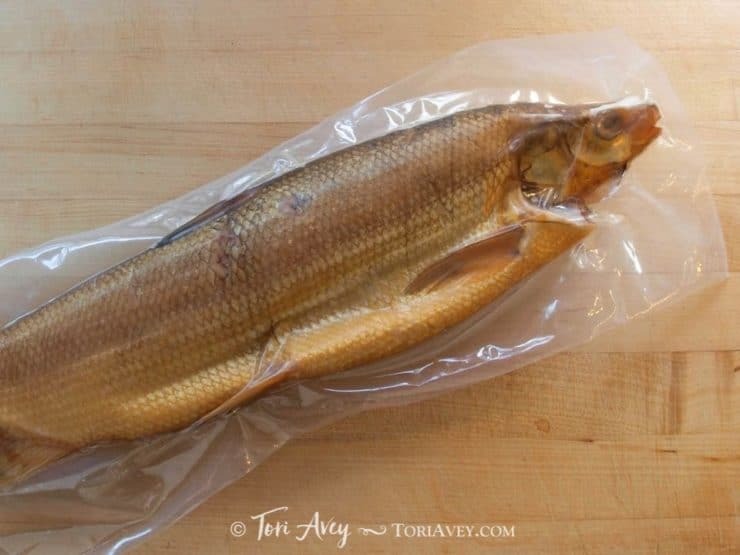 I used to order (whole) smoked whitefish online from companies around the Great Lakes and hated paying $75.00 shipping charge for 3 lbs of fish (which only cost about $25.00)! Finally, a local friend turned to me on to Costco. They sell it for $7.89 a pound (as of Sept 2012) – item# 33154. It is an in-store item only (they don’t offer it online) and vacuum packed; and Costco also sells Lox! No I do not work for Costco – but I go there for my Whitefish and Lox, every year to break the fast for Yom Kippur. Good luck! looks wonderful. When I wasstationed in Germany I had a small store I went to that had opened up inside a section that sold only smoked fish. It gave me an opportunity to try a variety of different fish (to include eel, river and sea).Many of them are really good and have a lot of flavour. Thank you for this good recipe.